This week I’m trying something new. I’m doing photo-blog posts on our time in Argentina. Today is Week 3: Chocolate, Beer, Lakes and Mountains in Bariloche. I hope you enjoy! 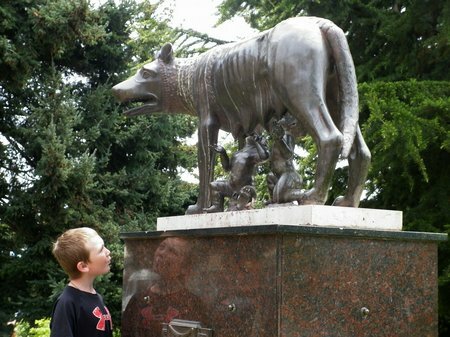 On our first day tourist-ing in Bariloche we came upon this statue of Romulus and Remus – particularly apt since the very excellent History of Rome podcast had kept us entertained (and sane) on the multi-day drive across the Pampas. This entry was posted in Argentina, International Escapades and tagged Argentina, Bariloche on December 19, 2010 by wandermom.